Home > Clothes > T-Shirts > Tie Dye T-Shirts > Tie Dye Rainbow Heart T-Shirt for Adults. 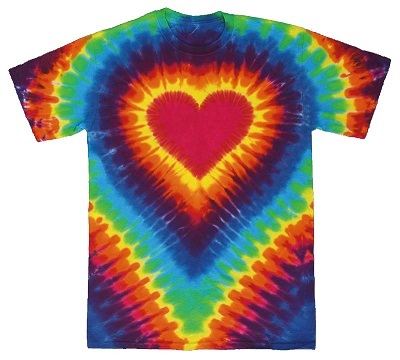 How about a little hippie love with this beautiful tie dye t-shirt. 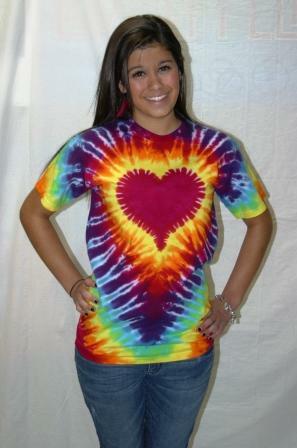 100% heavyweight pre shrunk cotton t-shirt that has been tie dyed and dip dyed to create a bright vibrant heart tie dye. Makes a great gift on for Valentine's Day! 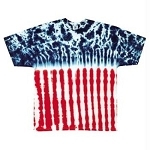 As with all tie dye, they are made by hand and no two are alike. Great shirts! I have bought many different styles. They are well made, don't fade and are a nice heavy cotton. Quick service. I have been looking for shirts for my kids and husband and I to wear when we go out to a busy location - we have five kids under the age of five. Needless to say I needed something bright and eye catching and in a variety of sizes from adult to toddler. Not only do these shirts fit my description, they are well made and the shirts are of great quality. I would definitely recommend these!